Remember when you were a kid and you got to play on the sit and spin? I absolutely LOVED spinning round & round on it until I was dizzy. Well now they are back & better than ever! 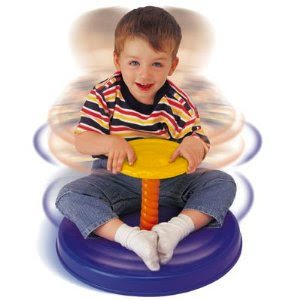 The new Sit & Spin has a sturdy base & allows for the child to decide how fast or slow they want to go. Bella just loves hers, and I think your child will too! Best of all, they run for only $19.99!! How great is that?! Disclosure: ﻿ I was in no way compensated to write a positive or favorable review, the opinions expressed are My Munoz Family's personal opinion! Hey there! I just wanted to thank you for following and wanted to let you know that I'm your newest follower!